Calgarians, for the most part are well travelled and well read. Of course it does not hurt that we have an international airport in our city. It never surprises me that when I am talking to my customers about their winter and spring travels, many had been to numerous gardens around the world. A beautiful garden does not happen over night. Any garden, no matter how small or large, can take many twists and turns as it develops over many years. We are inspired by viewing other gardens and often take ideas home from plantings we have seen. I myself try to work in little pieces of gardens I have encountered into my own garden. The art of garden design is a truly fascinating world. As I thought of different gardens Calgarians might enjoy experiencing many popular well-known names came to mind: Hampton Court, Versailles, Butchart Gardens, and The Huntington Botanical Gardens. Instead I have decided to share with you gardens that may not appear on your guidebooks' front page. Located in Wales, very close to the English border and about 3 1/2 hours drive northwest of London, is Powis Castle and Gardens. 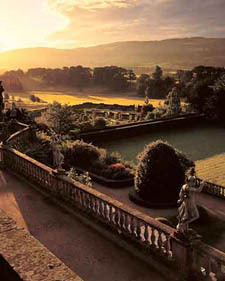 The grounds of the castle, which was built in about 1200, has one of the most amazing gardens in the United Kingdom. Flamboyant and stylish plantings create an awe~inspiring display. The garden became particularly well known when an Artemisia "Powis Castle" was introduced and sold at garden centers around the world. 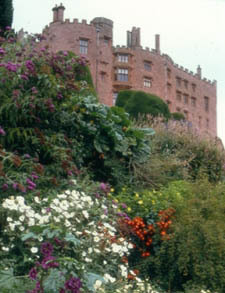 Clinging to the precipitous cliff face beneath the ramparts of Powis Castle lie long terraces gardens, each about 600 feet long. Every terrace has a particular theme. One terrace includes sun-loving influences from the Mediterranean, Californian and the southern hemisphere. Another terrace has tender Rhododendrons, surrounded by chain ferns. Another planting contains luscious herbaceous beds, an orangery, and an aviary, which is decorated with balustrades, urns, and original lead statues. The grounds include a massive clipped yew hedge, huge old apples and walkways that overlook amazing views of the River Severn, and the border countryside. You should plan to spend at least one day there, not only to take in the garden, but the castle is worth a look too. You may be tempted to get away for a long weekend to Arizona. Nestled amid the red buttes of the Papago Park just outside the city of Phoenix on the way to Scottsdale you will discover Desert Botanical Garden. In 1938 a small group of citizens gathered together to create a botanical garden. 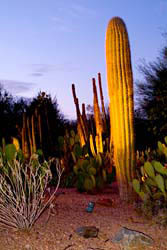 Today the garden hosts one ofthe world's finest collections of desert plants spread over 50 acres of land. With more than 300,000 visitors each year this garden is a must see if you are in the area. Although you might think the desert is just cactus, sand and sagebrush, you will be pleasantly surprised to know that 20,000 desert plants live in this garden. Well-educated guides are available to take you on narrated tours, although if you prefer, you may also make your own way around the trails, each showcasing a particular aspect of desert plant life. The butterfly exhibit is a popular destination. You will see hundreds of butterflies housed in a spacious enclosed lush garden. 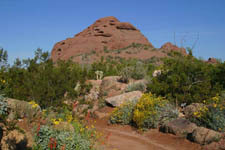 The Desert Botanical Garden presents two different butterfly exhibits each year. One takes place in the spring and one in the fall. Walking along the trails, you will see spectacular views of the desert, the Superstition Mountains, as well as some very unusual plants. 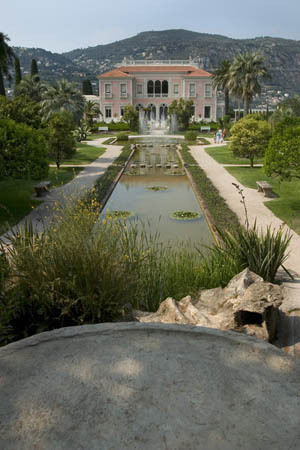 If you are going to France for the spring break, look up Villa Ephrussi de Rothschild. Conveniently located between Nice and Cannes, over looking the bay of Villefranche this garden is a stunning example of symmetrical formal French gardens. The garden was created by the Baroness Ephrussi de Rothschild who carefully sought out works of art to fill her home and garden from allover the world. The colour pink captivated her and the entire garden has an underlying pink theme. The garden is filled with palm trees, agaves and ornamental ponds, surrounded by nine magnificent gardens. The Rose Garden has close to 100 rose varieties. The Spanish Garden contains a marvellous dolphin fountain. The Florentine Garden's grotto and famed staircase encourage you to linger a while longer. The Stone Garden is set among arches, fountains, and grotesque figures, dating from the Medieval and Renaissance periods. The Japanese Garden offers a mixture of dainty ceramic temples and pagodas'. 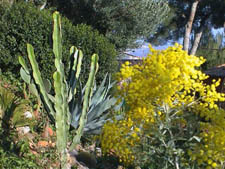 The Exotic Garden will astonish visitors with an extraordinary range of agaves and giant cacti. There is a Provencal Garden and a Sevres Garden, which provide striking views of the sea. But the most perfect Terrace is the French Formal Garden overlooking all the others. Of course you will need the entire day to see the garden and Villa, which also houses a museum. Our spring is not that far away and we too will be out in the garden once again. If you are planning a getaway, look up the local Botanical Gardens or ask about other individual gardens that might be in the area of where you are staying. Garden lovers are worldwide and I am sure you too can discover some hidden gem of gardens wherever you go.